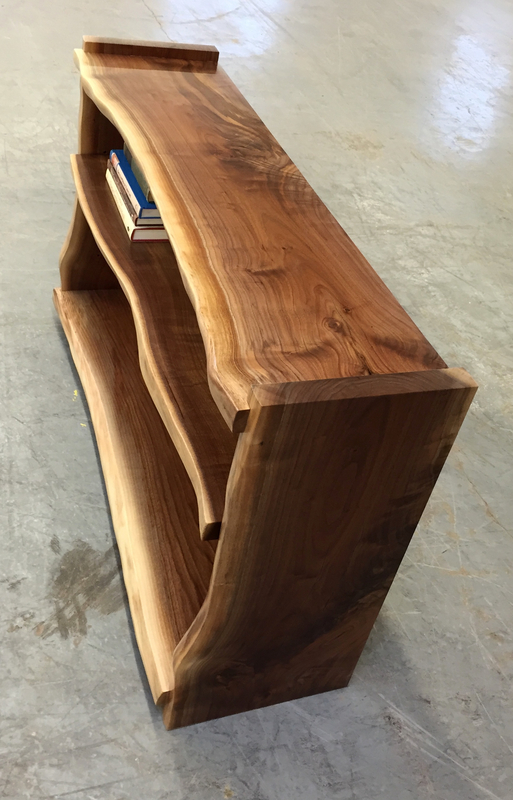 This seemingly simple, straight forward bookshelf was a little tricky for us. 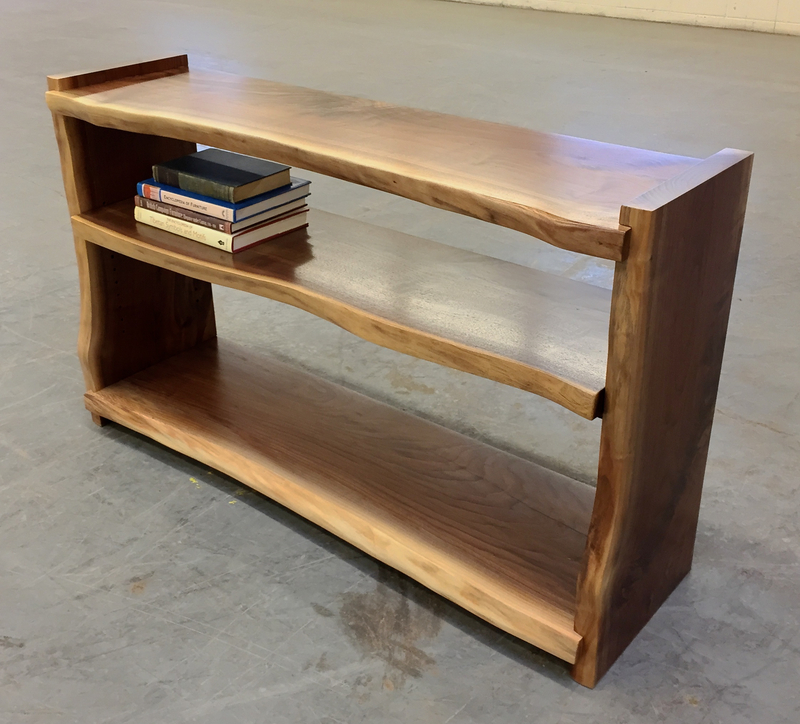 The client that comissioned it wanted us to make something that is on the one hand rustic and chunky, and on the other hand still refined looking. 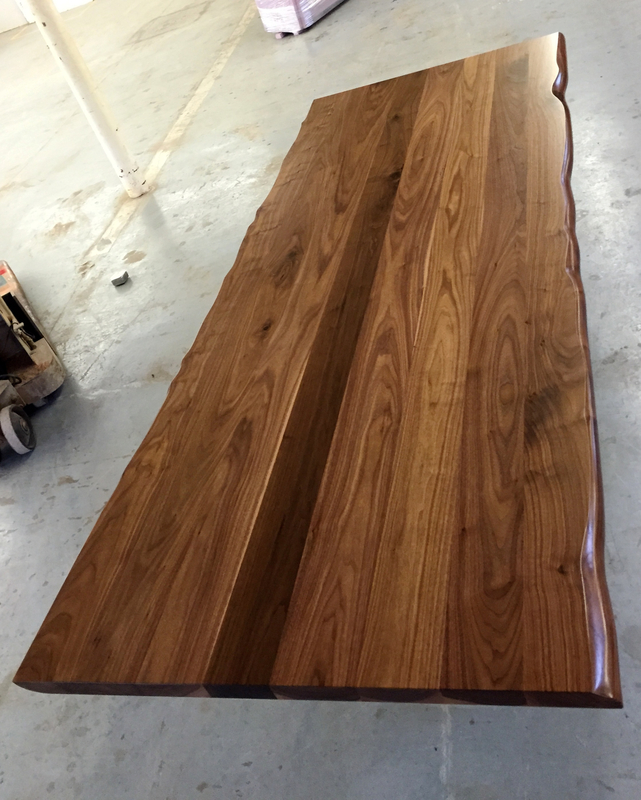 So we opted for using walnut rather than a more rustic wood like pine or fur, kept the raw edges but sanded them really smoothly, kept the thickness of the solid wood slabs of wlanut, but hid the way it's all put toghether to make the construction look more modern. 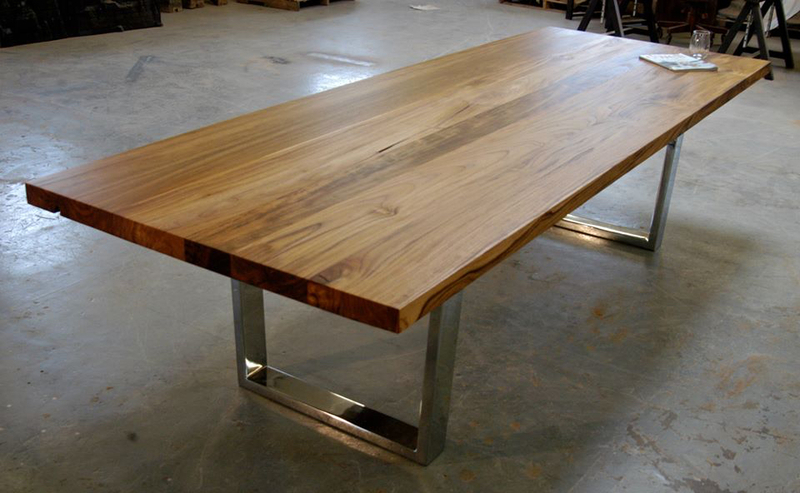 This solid teak dining table presented some interesting design choices for us. 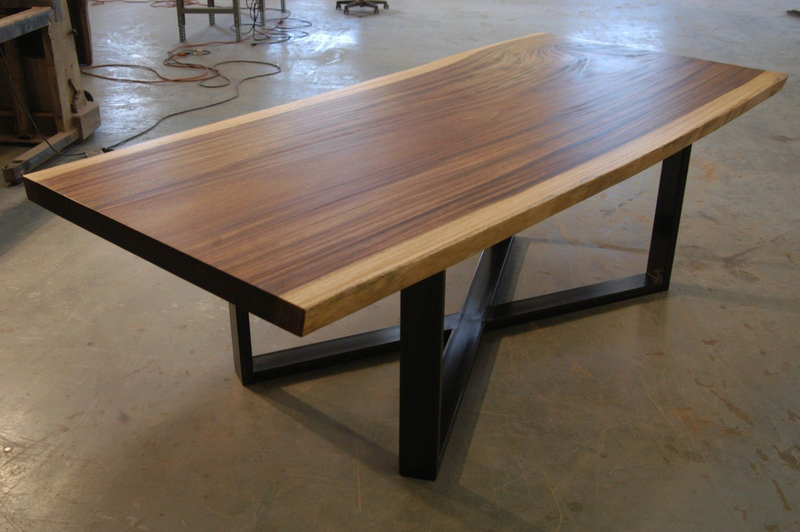 This client wanted an outdoor table that could handle the elements, not look like it had a couple inches of varnish on it, look refined, but also look casural enough for an outdoor table. So the chrome U legs added a big element of refinement, but we went with our rectangular tubing instead of the more modern flatbar version of this leg to give it more chunkiness. 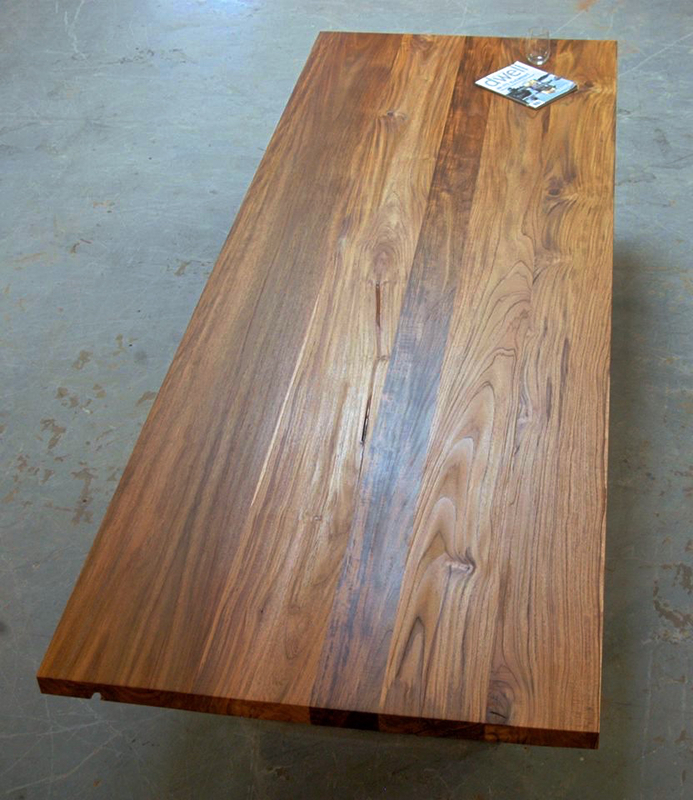 The solid teak slab top also had a few choices. 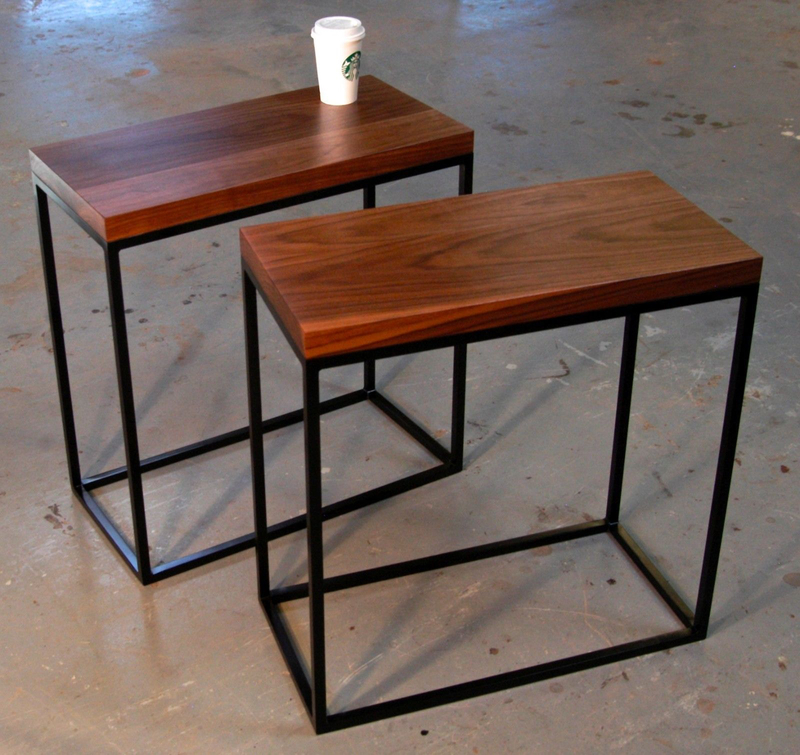 These are a really nice pair of contemporary end tables. 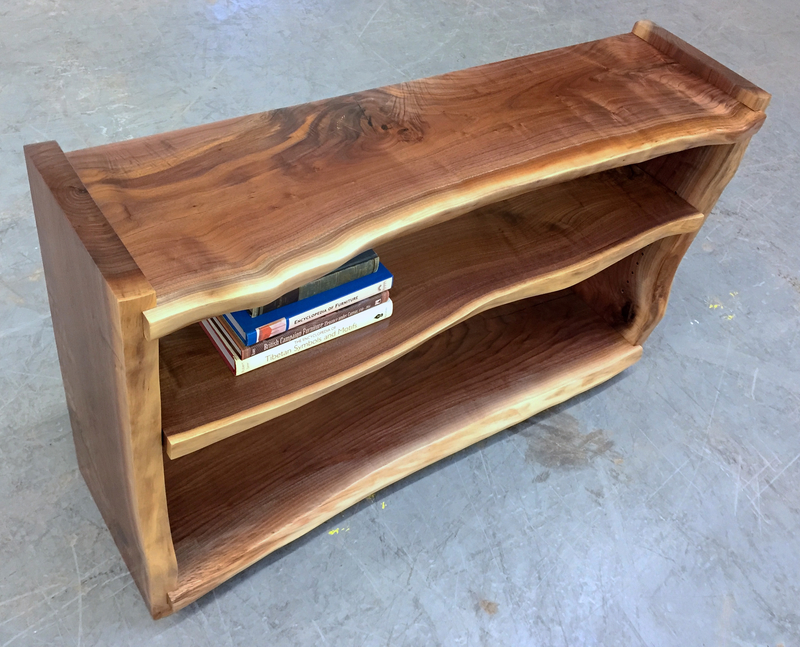 Very clean and simple in design, these reclaimed walnut end tables can wind up in a number of places: as a pair of sofa end tables, single accent chair table, bed side tables. 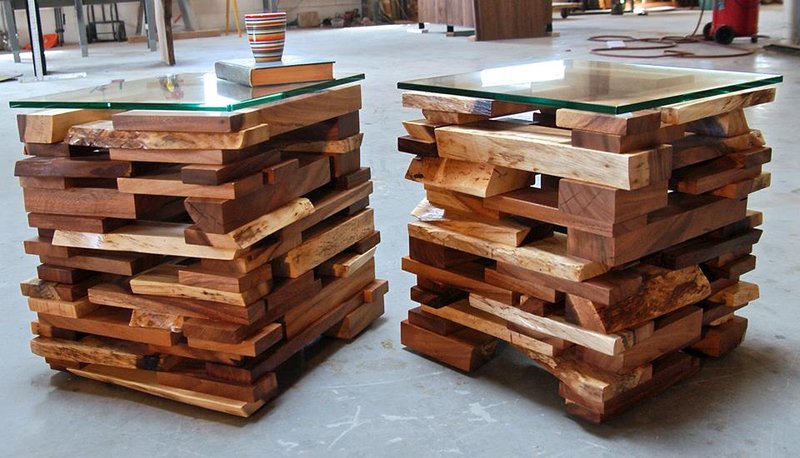 The nice thing about them is even though they are solid wood end tables, they are very light so you can move them all over the place, carry them room to room, bring them to work, take them on vacation.... 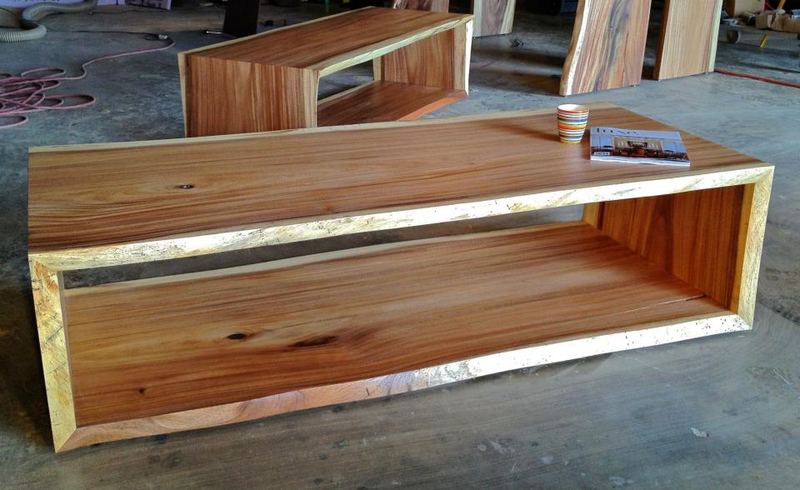 Anyway, the point here is they are versatile and good looking and of course orderable in any size. 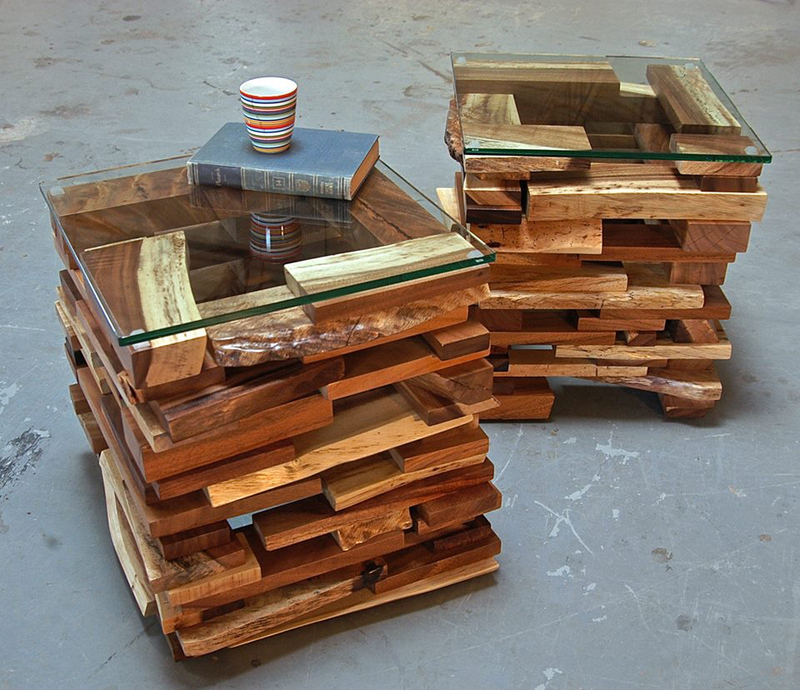 These remind me of our drum tables: we always have a bunch of wood cutoffs all over the place and are constantly trying to come up with ways to re-use it all. 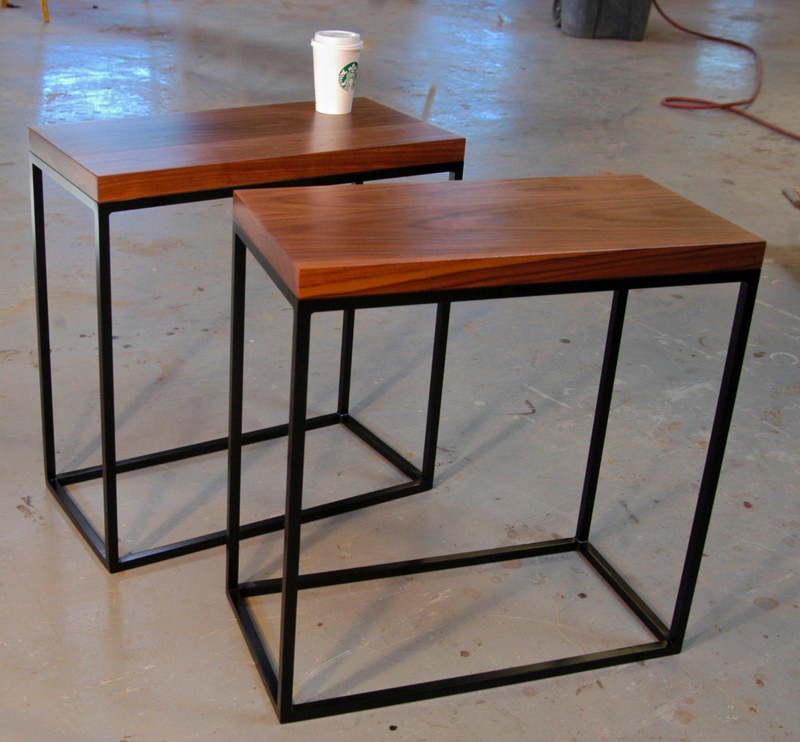 Of course on paper designing something like these scrappy side tables seems easy. 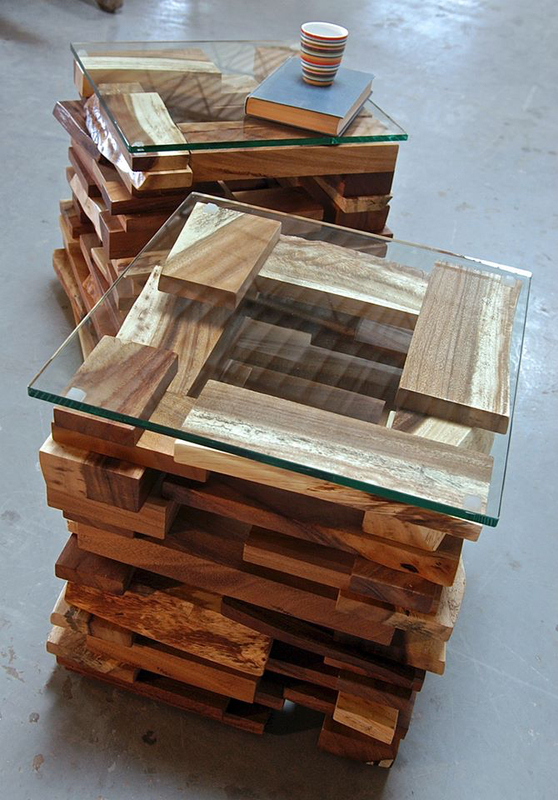 Get a bunch of pieces of wood, stack them all togehter, and there you have it. But that's far from the reality of making these. 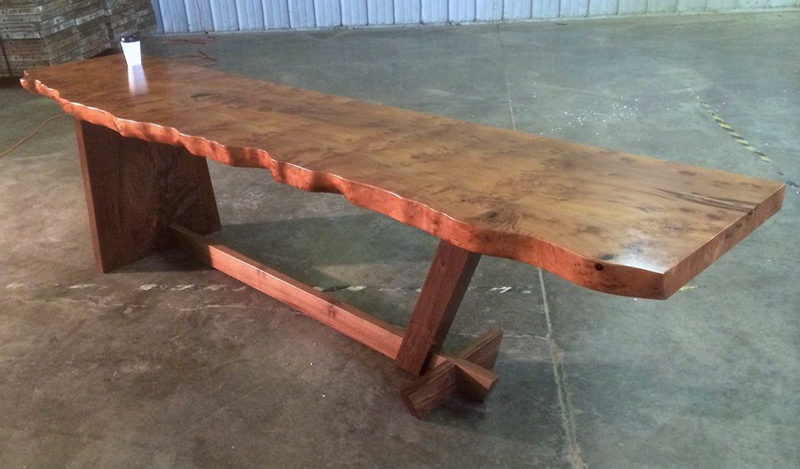 This reclaimed redwood root ties in well with the other redwood root console on our website. 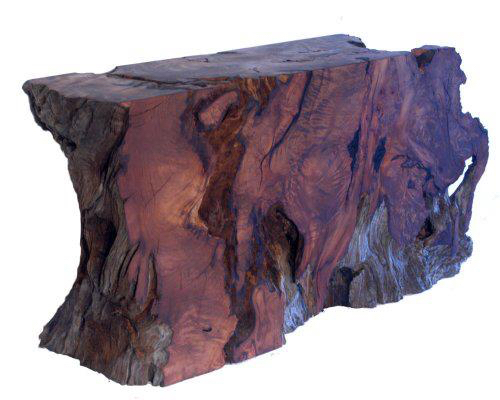 We actually use these two pieces as contrasting examples of what to pick from if you are looking for one of our root pieces. 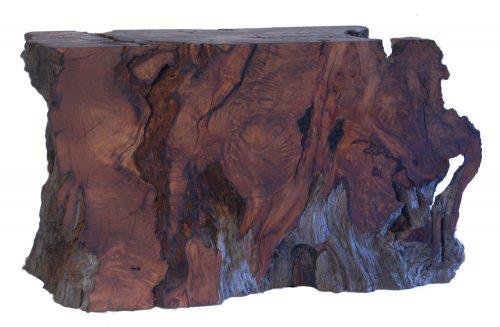 This one is a much more solid piece of wood which brings out the amazing redwood burl throughout the piece. 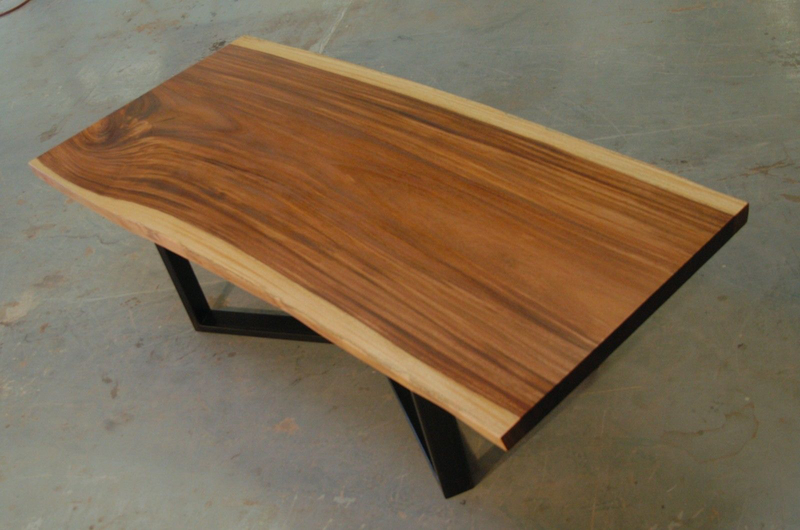 The more solid pieces also help to show off the cut lines of the console really well. 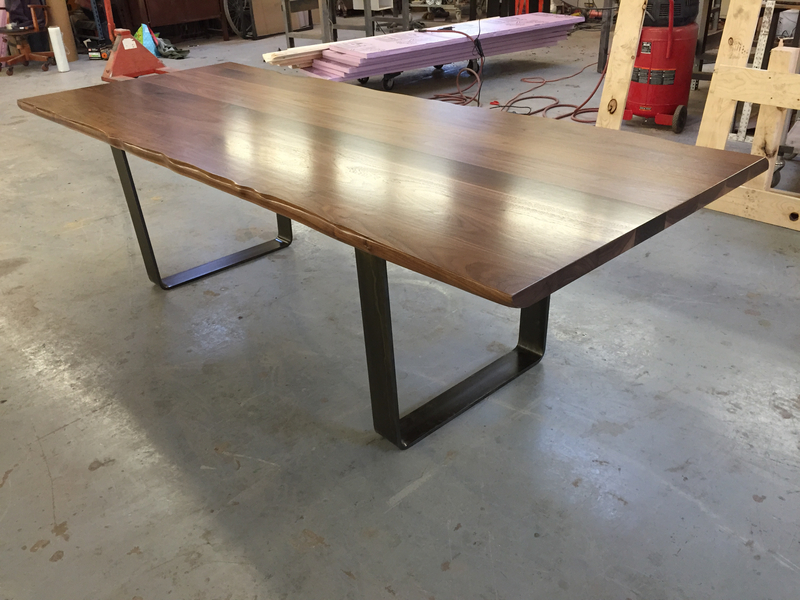 This was a small conference table we made for an office space. We gave it rounded ends but left the edges raw. 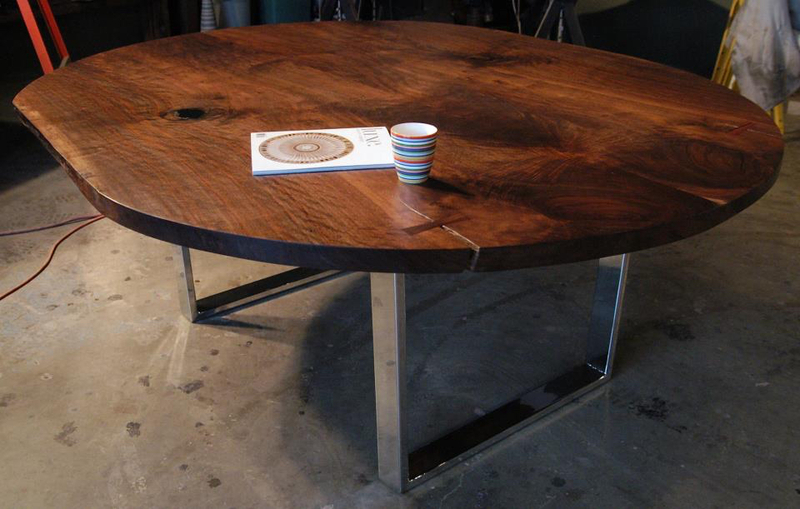 So the combination of a live edge with an oval appearance and the chrome legs created a really cool modern organic look to the table. 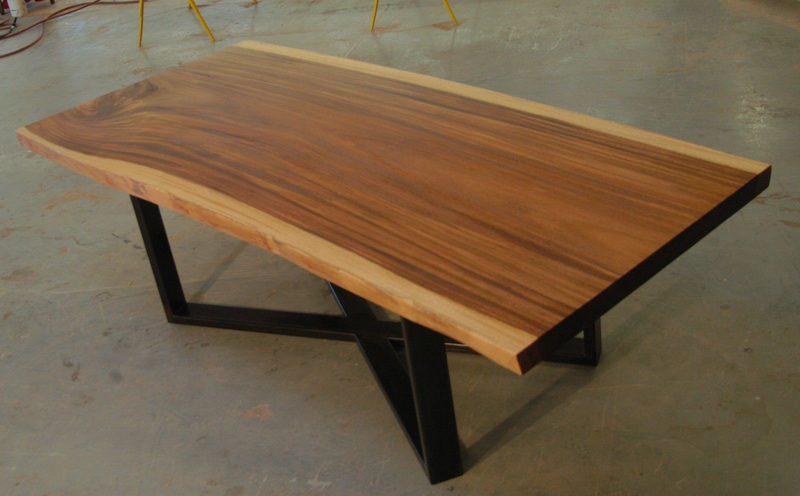 We used two awesome bookmatched claro walnut slabs for the top. 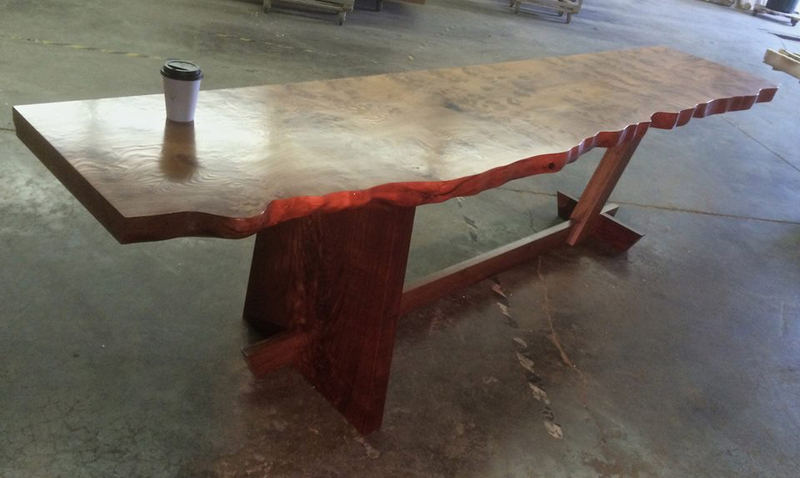 Teh table was 54" across by 72" long. 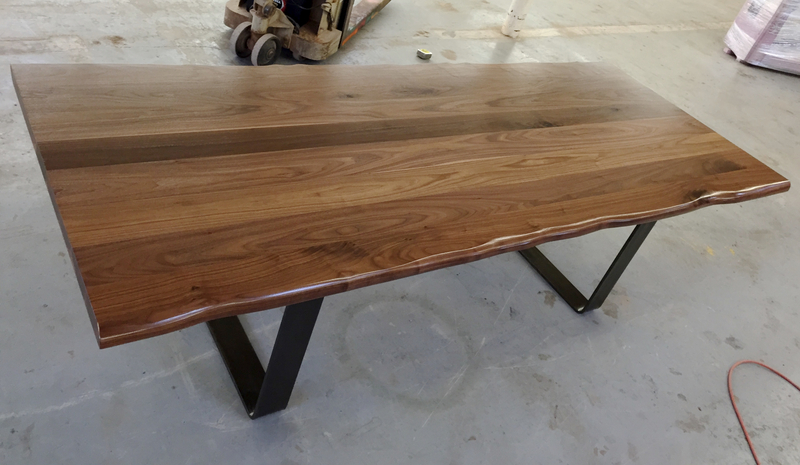 This was a desk we designed very close in hand with the client who ordered it. 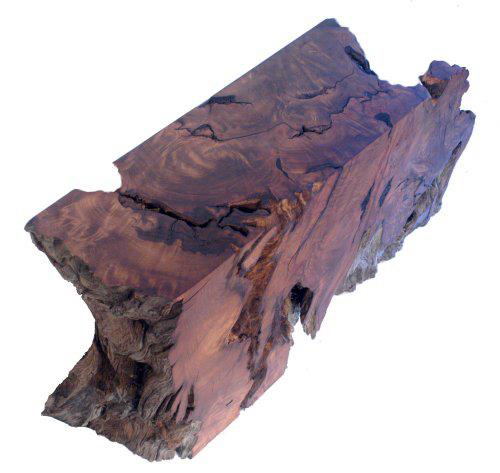 He wanted a base that reflected a Nakashima base he had seen somewhere. So we went back and forth with designs and photos for a while and came up with a really niceley, modernized Nakashima inspired base. 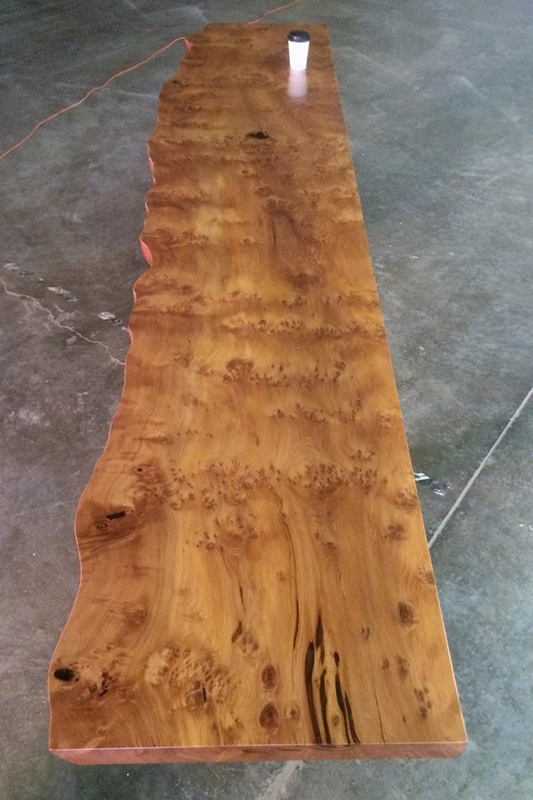 The top is actually a rare piece of burled redwood: each little burl looks like a little rosette, so the whole top is covered in little rosette burls. 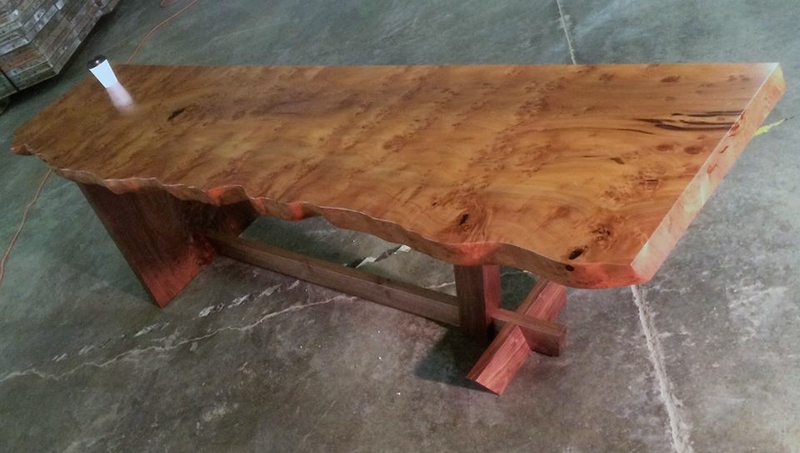 An eight foot long by 30-36" wide slab of redwood. 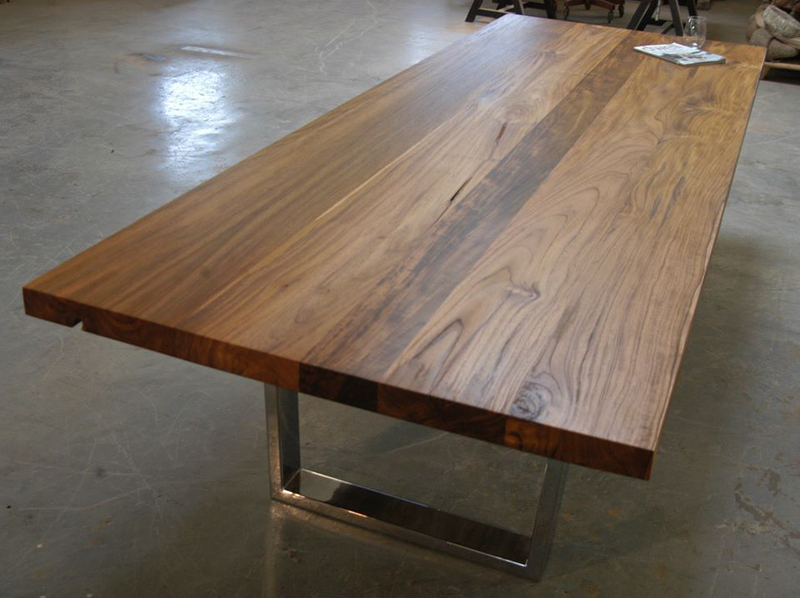 I should start out by saying we cold have done a much better job photographing this live edge walnut table. In one of the photos we even left the palet jack right next to it instead of simply reaching over and pushing it out of the way. 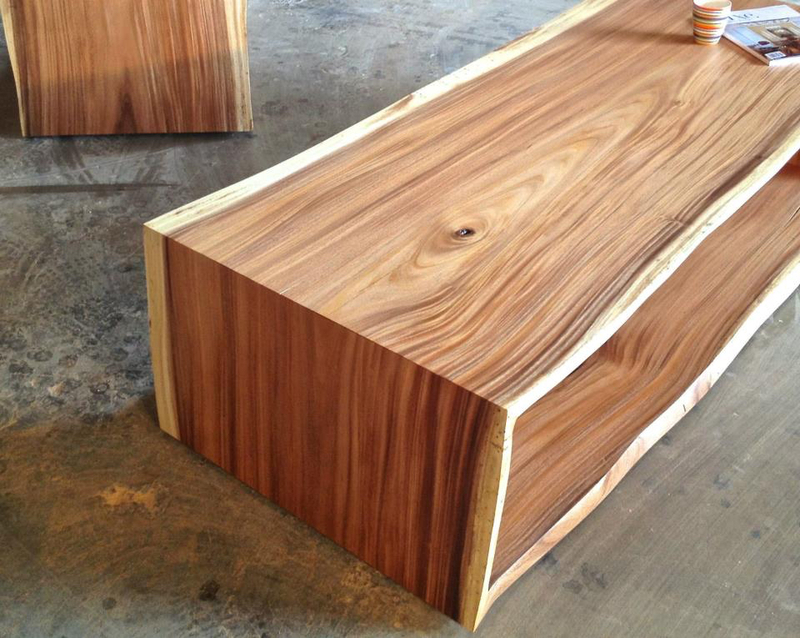 In any case, this is a great example of a multi slab walnut top with a raw edge that we made for client. They wanted us to pick out some contrasting slabs for the top rather than having them all match together. The thinking was/is that each slab will stand out and give them soemthing different to look at each time they are at the table. Monkeypod, and it's similar looking relative called parota wood are beautiful tropical woods. 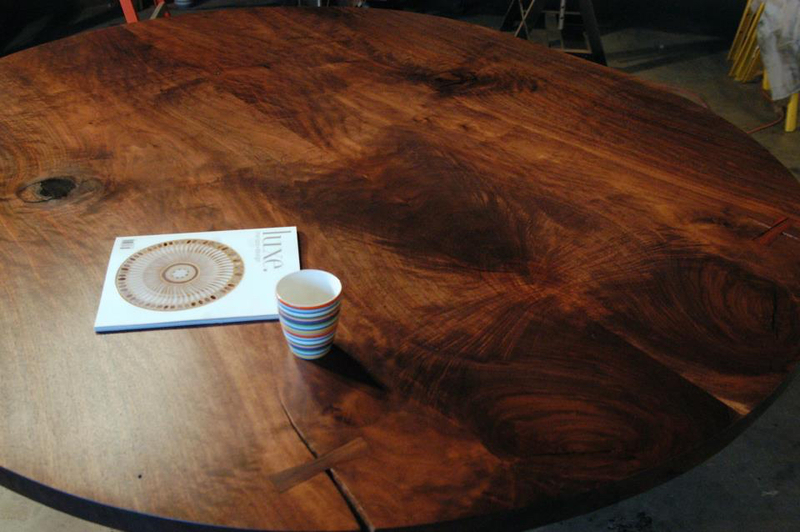 These four tables are made of monkeypod, the upscale relative of parota. 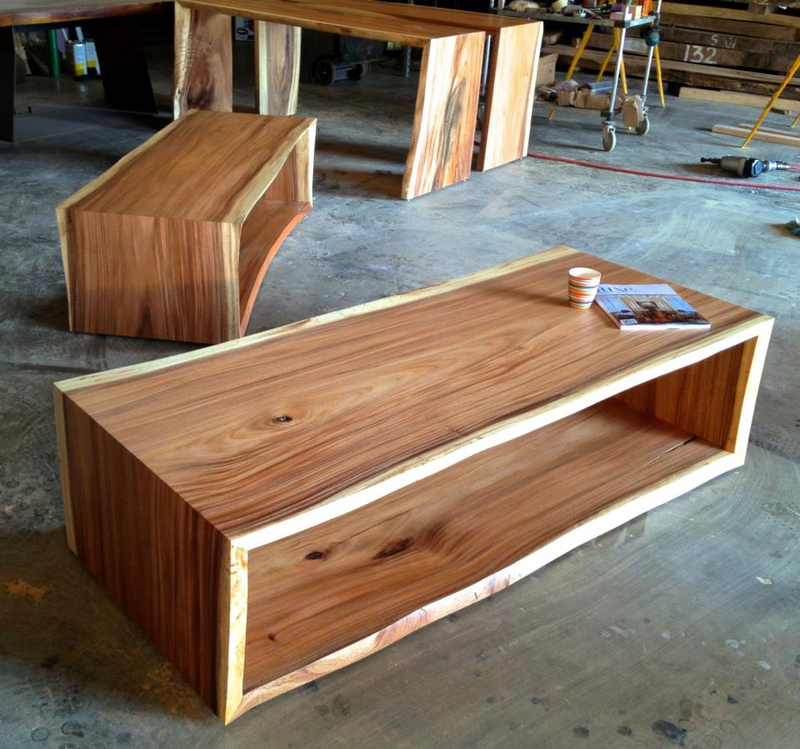 The exceptional part about the way these tables are made - especially the four sided coffee tables is they are made out of single slabs of wood. 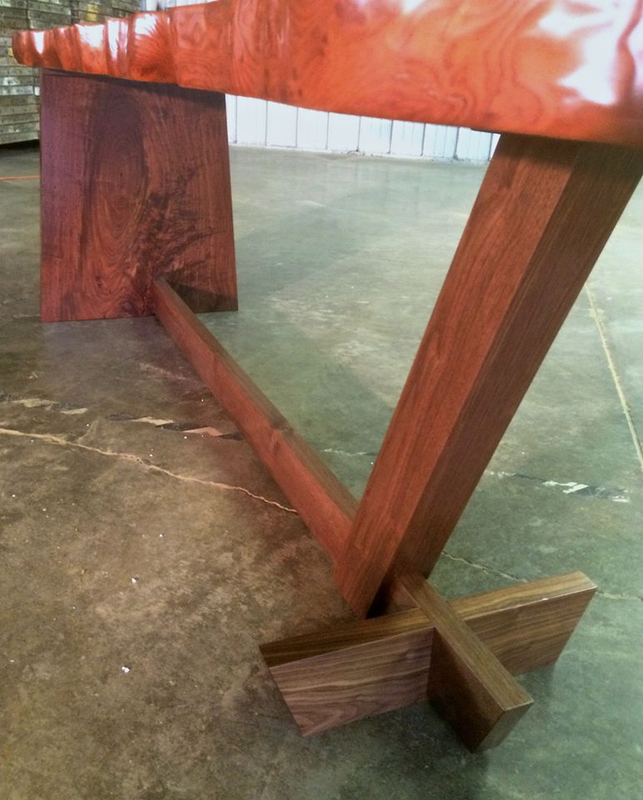 As a result - if you do the mitered joints correctly - you can follow the continuous grain up the leg, across the top and down the other side. 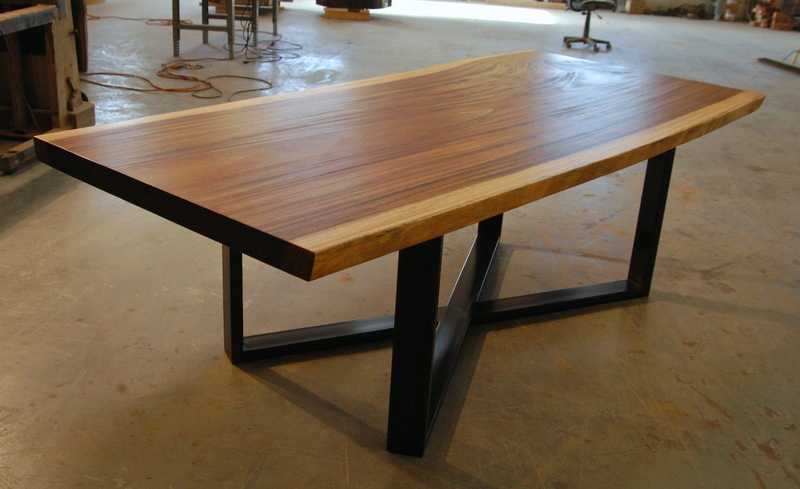 This monkepod dining table with a live edge has a very light stain to it per- the client's request in an attempt to tone down slightly the contrast between the light outer sapwood that defines the raw edge of the dining table and the brown heartwood of the overall slab. The X leg made out of rectangular steel tubing and finished with our standard (and most popular) gun metal bronze finish really adds movement to the piece.